Our first Girl Scout meeting was a success, and so were the Malted Chocolate Chip Cookies. I set them out on a plate and then baked up a quick batch of Pillsbury refrigerated sugar cookies as a non-chocolate alternative. The girls appreciated the cookies, and one future baker asked for the recipe. We had a lot to do, so I waited until the end of the meeting then ran upstairs and printed out a copy of the recipe. When I handed it over to her she looked at me and said “No, I wanted the recipe for those sugar cookies.” I showed her the packaging. Her mom looked relieved. So sugar cookies beat out the malt flavored chocolate chip cookies, but that didn’t stop me from making yet a new cookie with malt. 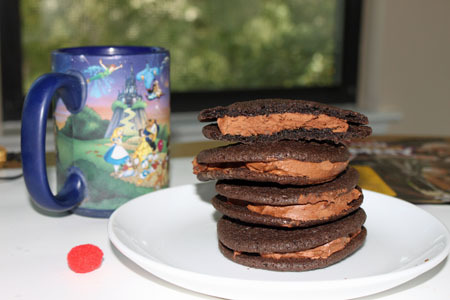 These are called Chocolate Malt Sandwich Cookies. They are very dark and chocolaty and have a good bit of malt flavor. When chilled, they become very sturdy so you can easily wrap them in cellophane or stick them in a (Halloween?) goody bag. They’d also be great with Halloween sprinkles, which I’m starting to see here and there. Update: In addition to the Martha Stewart recipe, there’s a similar version in The All American Cookie Book. This one uses natural cocoa powder rather than Dutch process and sour cream instead of creme fraiche. It also calls for a mixture of oil and butter than just oil. The cookies are soft and flat at first, but once sandwiched with filling they look a lot better. 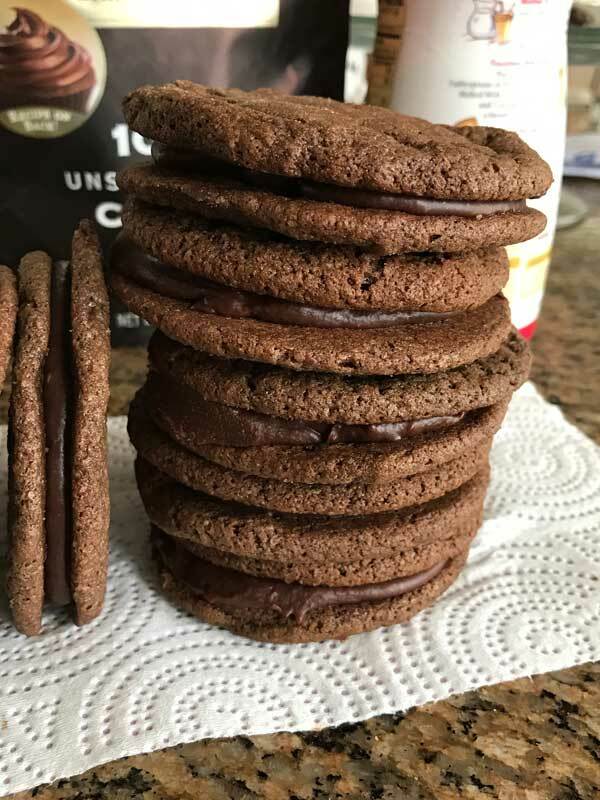 Chocolate Malt Sandwich Cookies are soft malted flavored chocolate cookies with a chocolate malt flavored fudge filling. Whisk together flour, cocoa powder, malted milk powder, baking soda, and salt. With an electric mixer, beat butter and sugar on medium-high speed until pale and fluffy Beat in vegetable oil, then stir in the sour cream. Mix in egg, and vanilla. Add half the flour mixture and stir until blended, then stir in 3 tablespoons of hot water. Stir in remaining flour mixture. The batter will be fairly soft. At this point you can scoop it onto the trays, or do what I do for nicer looking cookies. Scoop 36 portions of dough onto foil or parchment lined plates or trays that fit in the refrigerator. Chill the portions until they are slightly firm, then roll to make neat balls. Arrange dough 3 1/2 inches apart on parchment lined baking sheets and bake until flat and just firm, 10 to 12 minutes. Let cool on parchment on wire racks. Making filling: Melt chocolate and butter together in the microwave using high and stirring every 30 seconds. In a second bowl, beat the malted milk powder and cream cheese on medium speed until smooth. Gradually mix in chocolate mixture, and vanilla. Stir in the whole milk on tablespoon at a time. At this point batter will be too thin to sandwich, so chill uncovered for about 30 minutes or just until it is less runny. Sandwich the filling between the cookies. Tee hee about the recipe … I find kids seem to love that packaged stuff. My kids’ favorite Christmas cookies for years (maybe even now) are the sugar cookie tubes with pictures in the middle. Maybe they test market on kids. I love how soft these look. They look almost like Little Debbie Fudge Rounds! ohhh my god those look like cakesters! So funny about the sugar cookies…Kids. These malt cookies look great! We just got a container of Ovaltine for J (they were out of the double chocolate). He would love these cookies (as would Denis). I bet they are good even without the filling, they look so chocolate-y and moist. I love the sugar cookie story. 🙂 Those cookies look good too. I love the flavor of malt! your coffee mug makes me laugh! very cute. Oh my gosh, these look sinfully delicious! Beth, regular Ovaltine would be okay but I think the chocolate flavored type might be overkill. Those look good! I’d really like one right now – a 4:00 pick me up would be good! I only have the chocolaty Ovaltine in my pantry. Can I use that in place of the malt powder? I can’t wait to find me some of those Pumpkin Pop Tarts. I agree 100 with you, toasting is a must. Thanks! LOL about the sugar cookies. For a long time my kids thought that “store bought” treats had some kind of cache. Now that they are teenagers, thankfully, the prefer homemade! I think that’s funny about the sugar cookies! I’m telling you though – I’ve gotten lots of compliments for store bought cookie dough – probably more than homemade! I guess it’s hard to copy that taste that everyone loves! I wish I had one of these to enjoy right now!! They look and sound wonderful.